On 26 February 1918, over 10,000 from all walks of life joined the annual Lunar New Year “Derby Day” races at the Happy Valley Racecourse. Due to overloading, the bamboo-made stands collapsed and caused a disastrous fire which eventually claimed more than 600 lives of various nationalities and background.After the calamity, the Tung Wah Hospital swiftly offered healing hands to the victims, the affected families and arranged for labourers to collect the dead bodies. Tong Yat-chuen, the Chairman of the Tung Wah Hospital 1918/1919, appealed to the Government to allocate a land for use as a burial site on 3 March 1918. Four Board Members of the Hospital, namely, Ho Tai-sang, Ho Ngok-lau, Look Poong-shan and Choi Kwai-ng were entrusted to invite monks from the Dinghu Mountain, Zhaoqing, Guangdong to host Chinese mourning rituals at Happy Valley to pay homage regards to pacify the spirit of the victims and the sentiment of the affected families.A land at “Coffee Garden” was then allocated as the burial site. 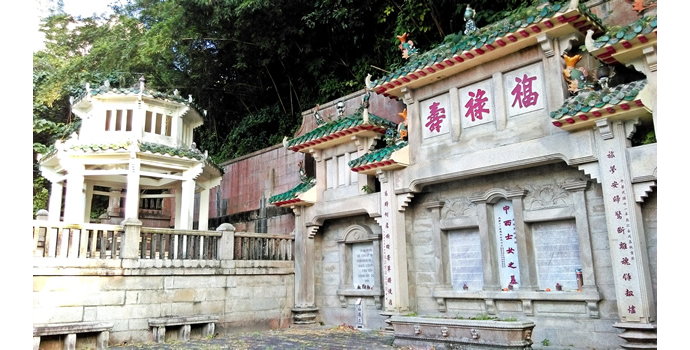 The Tung Wah Hospital held an architectural design competition for a permanent monument to be erected at the burial site and eventually selected the design from Ho Sheung. With the benefit of public donations, the Memorial was completed and designated as the Race Course Fire Memorial in 1922. 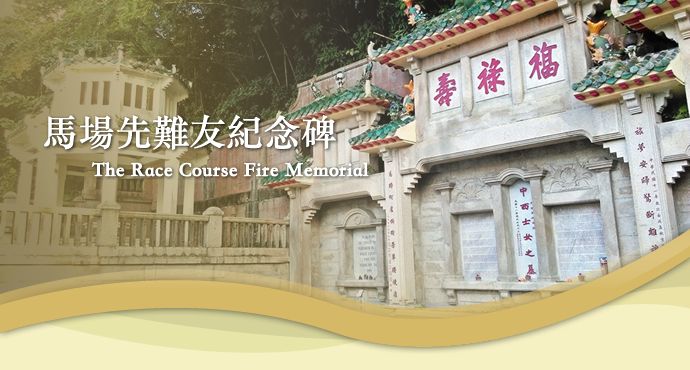 It was later relocated to the existing location to tie in with the district development plan of the Government.With funding from the Hong Kong Jockey Club and the Tung Wah Group of Hospitals, the Memorial was repaired in 1974, 1983, 1993 and 2010 respectively under the advice from Government experts, and will continue for the conservation of the Memorial. 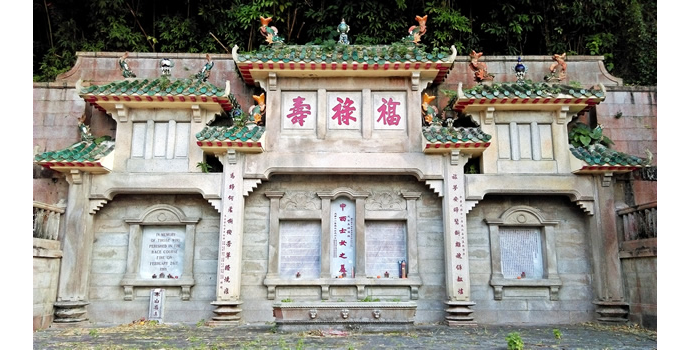 As of today, the Board of the Tung Wah Group of Hospitals has continued to uphold the custom of paying respect to the ancestors reposed at the Tung Wah Coffin Home and the Tung Wah “benevolence cemetery” on the Ching Ming Festival day every year. They also send Tung Wah staff to grave sweep all Tung Wah “benevolence cemetery”. The Memorial was declared as a monument on 23 October 2015 by Hong Kong Government. 1. The newspaper report of the Race Course Fire. 2. The main central archway is inscribed with the characters “福”(fortune), “祿”(riches)and “壽” (long life). Each bay consists of a Classical Italianate granite niche, containing marble memorial plaques. Below the right-hand side plaque is an Earth God shrine (后土). The whole composition shows great architectural talent in cleverly combining both Western Classical as well as traditional Chinese architectural elements. 3. Two octagonal Pavilions on the top terrace of the site, are of two-storey construction and supported by eight slender columns of reinforced concrete. The roofs are covered by Chinese green glazed tiles; fixed tables and stools constructed of granite and concrete are placed inside for the benefit of visitors. 4. A pair of traditional Pagodas is constructed on the next lower terrace; the Pagodas are octagonal with three storeys. 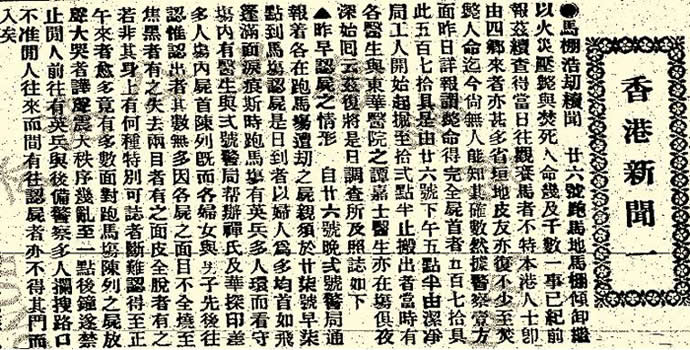 The characters, “寶塔”(precious pagoda) are inscribed on their front elevations. 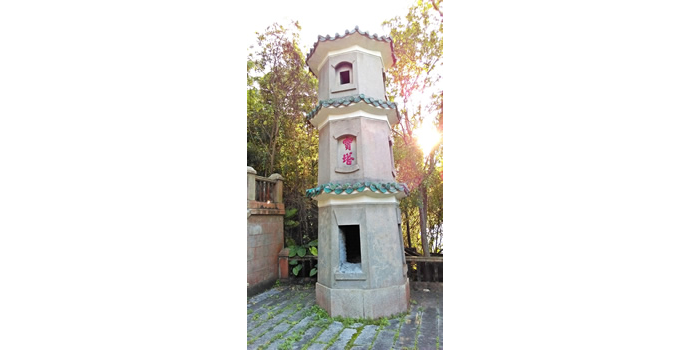 The Pagodas have also been constructed for use as furnaces for visitors to burn paper offerings.